Whether you live in Northern California, the plains of the Midwest, or on the Eastern seaboard we're seeing more and more modern farmhouse designs. It's a growing trend with a fresh, unconventional take on the traditional farmhouse. After all, it's our country's rich history of farming and pioneer living that are the inspiration for today's modern farmhouse. So now we've turned to one of our own talented Elite Designers, Elena Calabrese, who recently designed a modern farmhouse where she beautifully mixed modern with earthy, rustic elements. Known for her eclectic style and modern sensability we asked Elena to share her top 7 tips on how to get this look. I like the juxtaposition of modern furniture with rustic elements such as the stone fireplace. Try reclaimed wood on sleek plastered walls. 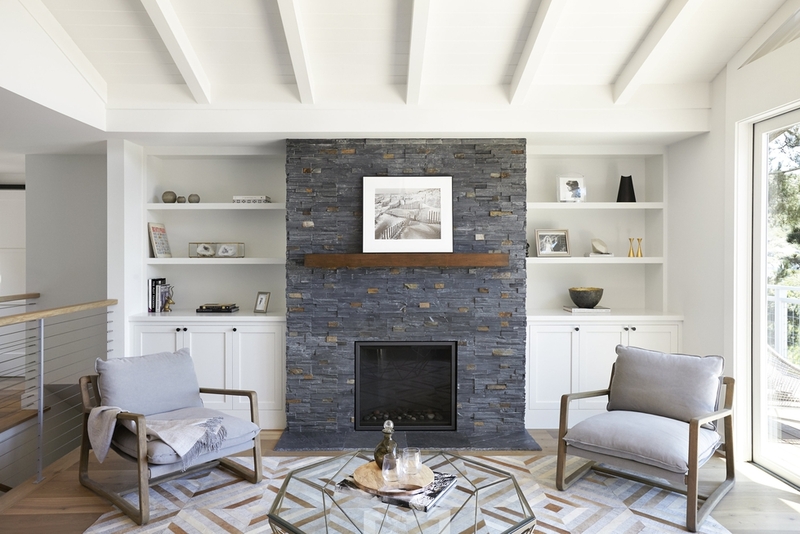 Pitched roofs, coffered ceiling or simple white beams always help to give that authentic modern farmhouse feel. When you pair the white walls with steel beams you instantly create that architecturally modern farmhouse feel. Another trick is to paint the trim slightly brighter and whiter than the walls. For the main parts of the house, on the walls and ceiling I like to use Simply White by Benjamin and for the trim and windows Chantilly Lace. High contrast natural materials pop off crisp white walls. Use neutral hide rugs for texture and add pattern. To keep the “Modern Farmhouse” look interesting I like to use ethnic-inspired textiles and tribal patterns which can give the space a little bohemian feel. Also mixing in vintage pieces such a rug or a family heirloom like a beautiful wood console or side table can give the space a collected-over-time look. For the modern farmhouse look, keep it clean and uncluttered. For accents try a simple palm leaf in an oversized glass vase to give a natural vibe to the space. Also use varying textures in a sparsely furnished room such as the bedroom to keep it warm and inviting. My favorite off white paint of the moment is Benjamin Moore’s Silver Satin. I love a glass coffee table to show up the area rug. Also a lucite bar cart is great for multi use and keeps things visually light. Of course, always a party when there is a well stocked bar cart! I love mixing modern with retro. Use old school house lighting paired with sleek tile or flooring. Also, you can use warm wood furniture or cabinetry combined with creamy grays and crisp whites. Also, I love to bring in sheep skins and flokati rugs to give it a more current look. Add some architectural interest by mounting a sliding barn door instead of a traditional door. I like to use the rustic harware instead of the silver brackets. Thank you Elena for sharing your helpful design tips. If you're feeling inspired and would like your own modern farmhouse design then start a project with Elena today. Or you can work with any of our 400 + designers to create the room of your dreams—within your style and budget. Happy Decorating!